Beitostolen lies on the edge of the beautiful Jotunheimen National Park, just 40km north west of Fagernes, which means a short transfer of just 45 minutes. It is a compact, friendly ski resort with a choice of accommodation situated around the ski base, literally metres away from the slopes and resort facilities. The ski area has an excellent snow record (from November to May) and offers gentle, uncrowded slopes ideally suited to beginners and families who’ll benefit from learning in a safe, confidence-building environment. There is a good choice of other winter activities such as dog sledding and snowmobiling on offer, plus organised family-orientated activities everyday from 3pm so even the smallest family members can experience more than just skiing or snowboarding. 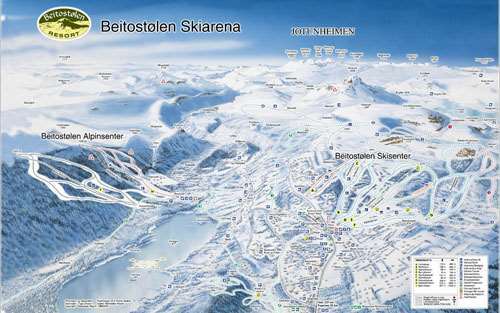 This compact resort of Beitostolen is situated around the base of the ski area. With all the resort facilities within easy walking distance, guests will find it extremely hassle-free to get around. For a small village, there is a surprising number of restaurants, bars and shops to choose from, plus a supermarket and bakery, all housed in attractive wooden cabins. Après ski tends to be low key during the week in one of the four bars in resort, but livens up on weekends and during public holidays when live bands often play. Off the slopes, there are plenty of activities to choose from and during the winter, organised family activities every day, geared towards parents and children. Great place, nice skiing, chilled, relaxed and fun. Great for beginners and intermediates.